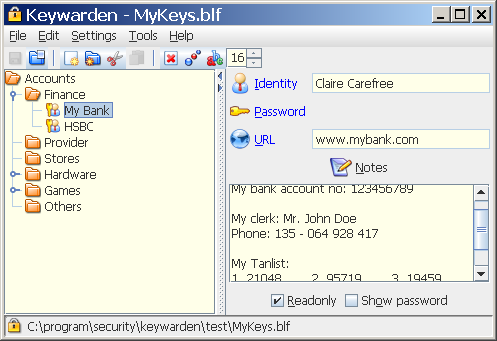 Keywarden is an easy-to-use and highly secure password manager which stores your different passwords, login-information, credit card numbers and other security related data in a clearly arranged place. Keywarden optimally protects your data with the generally accepted Blowfish encryption. Your advantage with this: You simply use a single master password to access all your different passwords. You only need to remember this single password! - Export via XML: Keywarden allows export of account information in the universal XML file format. This allows to use the data within other programs. - Browser integration: A single mouse click on the URL of an account leads you to the corresponding internet site. - Privacy: The password can be hidden so that occasional observers cannot have a look at it. It can easily be copied to the clipboard with a mouse click while being invisible at the same time. Qweas is providing links to Keywarden 1.4.4 as a courtesy, and makes no representations regarding Keywarden or any other applications or any information related thereto. Any questions, complaints or claims regarding this application Keywarden 1.4.4 must be directed to the appropriate software vendor. You may click the publisher link of Keywarden on the top of this page to get more details about the vendor.